“Agile doesn’t work”, I often hear managers saying so convincingly that I could really believe them. But when I listen more carefully, I hear something else. These managers are afraid to lose the privileges they have gained through their experience in managerial roles, not to mention their status and job. 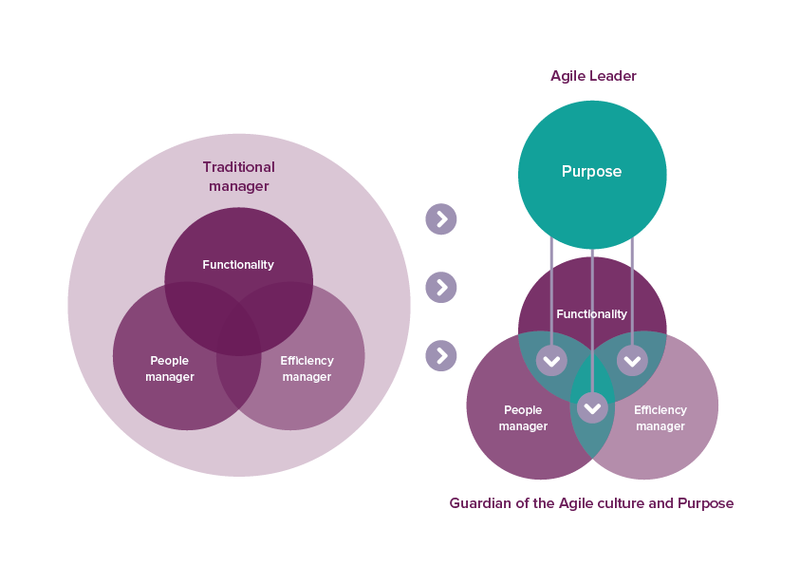 In this article, I address why Agile doesn’t work the way it is implemented today by elaborating on the psychology of managers and I explain how managers can optimally balance the ‘servant’ and the ‘leadership’ part in Servant Leadership. In my previous article I described How passion makes you a better leader and I addressed why things are not working out with management and leadership. In this article, I continue my quest for the optimal leadership style among managers. It all starts with the correct implementation of leadership. Servant Leadership seems to be the right solution now. But it is frequently misinterpreted and misimplemented. Some people say: “The managers first need to ‘let go’, ‘do a step back’, ‘give space’ and then start ‘serving’ the employees and the teams.” This is easier said than done. From their perspective, managers had to unlearn the behavior that had brought them nothing but success in the past. And now the Agilists say that “past results are no guarantee for future results”. So the managers’ very first thought is: “How can I keep control of everything, and which KPIs should I use to achieve complete control?” After setting the KPIs and fully distancing themselves from the teams, the managers were proved right after about six months, when the results eventually did not materialize. So then they felt strengthened: “You see? Teams cannot do it by themselves, Agile doesn't work!”. This resulted in managers reverting to their old behavior and the Agile cultural change failing miserably. As I mentioned above, it is all about the way you let go. I usually present complex issues in a simple way by using metaphors or small exercises. So, let’s do a small exercise to experience the different ways of letting go. The background in this exercise is that the Agilists often say that managers must ‘let go’. Letting go means that the manager should not interfere with everything, but should give the individuals and teams freedom, instead. Here is a short and simple exercise to understand what letting go really means. Pick up your pen. Take it in your hand. Hold your hand about 15 cm above the desk. Now let go of the pen. If your pen is on the desk, you applied the traditional way of letting go. The employee or team are literally on the floor. They don’t feel assisted - on the contrary, they feel they were just smacked in the face. 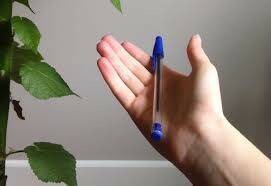 If you still have your pen in the palm of your hand, you understood. This is the right way of supporting the employee and the team. Give space and support when necessary, by taking 2 steps forward instead of 2 steps back. This way of letting go creates an optimal, safe working environment. The first way of letting go is frequently chosen as the preferred style. Unfortunately, this is not just the case in this exercise - this also really happens on the work floor with managers and their teams. In his book 7 habits of highly effective people, Stephen Covey described the 5th habit as follows: ‘Seek first to understand, then to be understood’. But did we really understand what would happen when we introduced Agile within the management layers? Implementing Agile makes managers nervous about their role in the long run. Therefore, their natural self-preservation and survival mechanisms will subconsciously take over. Moreover, there has been an over-focus on the 'Servant' part of Servant Leadership. This amplified the feeling of fear that all traditional behaviors that were successful until then, were no longer required. The feeling of need to become a “soft, serving manager” directly clashes with the ego, which still feels that one should be a strong, directive manager. Consequently, the manager will do everything to prove that Agile does not work, as his ego has been trained that he cannot fail. Numerous sociology and psychology books have addressed this topic, but unfortunately they have not dealt adequately with how to be successful in a managerial role. Isn’t this an example of another good reason why letting go often fails miserably? As seen above, focusing only on the 'Servant' part of Servant Leadership seems not to be the right answer. In that case, managers feel a great gap between traditional and expected new behavior. However, when they focus in the right way on the ‘Leadership’ part of Servant Leadership, it is expected that they succeed much more. But what is the right way? At this moment, fierce competition in the market pushes organizations for more sustainable competitive advantages. Customers are more mobile, more informed, less loyal, and more demanding. Start-ups enter and disrupt markets more easily. The characteristic style colors of managers, yellow, orange and red, are a great match for the current disruptive era. However...There is a strong need for leadership to be practiced in a different way and only then will the ‘servant’ part fall into place. Let me elaborate on each of these approaches. Too much (overdrive) of the 'Winning' approach will lead to a leadership style that mainly results in managers drifting away from employees. This outcome can be measured by the low scores of commitment and engagement among the employees. Metaphorically, the managers have already passed three train stations, but the employees are still waiting to get on the train. Too much focus on the ‘Me’ approach will create a leadership style that makes the individual employee really feel harmonious with the team and their environment, but he/she doesn’t feel that they contribute to any valuable organization results. Thus, with the overdrive of this approach it is evident that low scores of ownership and low contribution to organizational results can be encountered. Too much focus on the ‘Agile’ approach will create a style of leadership that nourishes too instrumental/technical people who just do the typical process steps without internalizing any of underlying Agile principles. The focus is on the implementation, not on the adjusted mindset. In the end this approach can result in too low agility of the employees. Ultimately, this results in a low contribution of continuous improvements of the organization and its system. The keyword is balance. 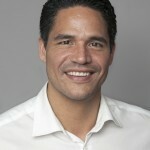 Consequently, the overdrive of a single management approach will throw you off balance. This balancing act for managers needs to be successfully executed to win in the current age of digital disruption. Notice that we failed in balancing these three approaches on a large scale in the past. We have just entered the ‘consciously incompetent’ stage, so there is still a lot to learn. 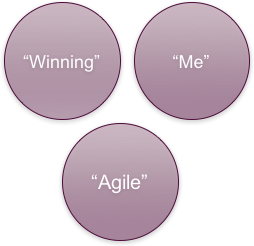 The trick to win is via the ‘me’ and the ‘Agile’ approach (from step 1 to step 3 as shown above). Be aware: to reach the desired results, always balance all three approaches, not just a combination of two. So, start winning by setting team goals, derived from organizational goals. Support the employees with a green-color behavioral style, to enhance their commitment and engagement. And finally, use the customer-oriented Agile way of working to quickly measure the impact on your cascaded goals from top-level to team-level to grow ownership on employee level. The manager should not be involved in functional aspects, as this is where the Product Owner steps in, neither in team optimization, as this is where the Agile coach steps in, nor in the improvement of employees’ expertise and skills, as this is where the competence lead steps in. Instead, the manager should become Servant Leader. The Servant Leader is the curator of the system and the associated culture, behaving as an Inspiring Leader. This sole purpose of the Servant Leader is to create a fantastic work environment with distributed goals, where he/she aims to make him/herself redundant. In this article, I attempted to give you insight into the change of the manager’s role to a Servant Leader. But is this enough? Not even close. There is a lot more to elaborate on to crack the code of the Agile Servant Leader. Therefore, in my next article, I will focus more on The Situational Leadership Model and how to give support to employees as a manager on a situational basis.